I'm not generally a big fan of tilt-control in my mobile games. Over the past few years only one mobile game that used the accelerometer as its primary means of control has really grabbed me, and that's One Man Left's Tilt to Live. 2K Play's GridBlock makes it two. Gridblock is a game about matching colored blocks to colored spaces on a grid via tilting your preferred mobile gaming device. Blocks slide across the playfield in groups or individually, locking into place when they come into contact with the matching space. It's rather simple, at least initially. As the player advances through the game's nine worlds (two come free with the app, the other seven can be purchased in-app for $2.99), new mechanics are introduced. Some blocks are multi-sided, requiring the player tap the screen to flip them to the right color. Color-changing devices warp the hue of blocks coming into contact with them. Explosive squares will destroy blocks that come into contact with them, but also free nearby locked blocks into play. Viral blocks transmit their coloring like a disease. GridBlock is quite challenging. Thankfully that has nothing to do with the tilt-controls, which are spot-on. This is a game that requires precision movement via a generally imprecise control method, yet a heavy-handed lummox like me had no problems driving the blocks around the board at all. 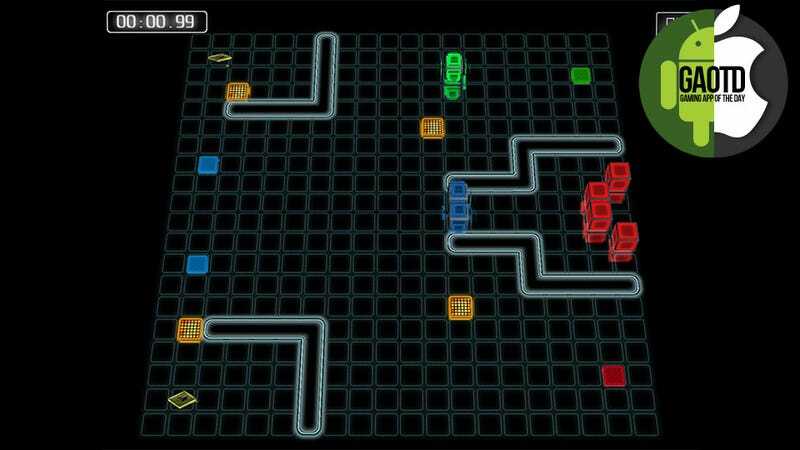 With more and more mobile games trying to achieve console-level graphics and gameplay, it's refreshing to see a game like GridBlock — a game that embraces one of the features unique to the mobile platform.